The New Year is finally here! And to ring in 2017, we’ve gathered a brand new batch of top blogs to kick your new year off right. Here are the top blogs to keep an eye out for in January. Writing for a technical audience is no easy task. Technology-focused blogs need a content team with a unique skill set. These bloggers need a strong understanding of the technology they’re focusing on. And they have to package their knowledge in a way that captivates and sheds light. 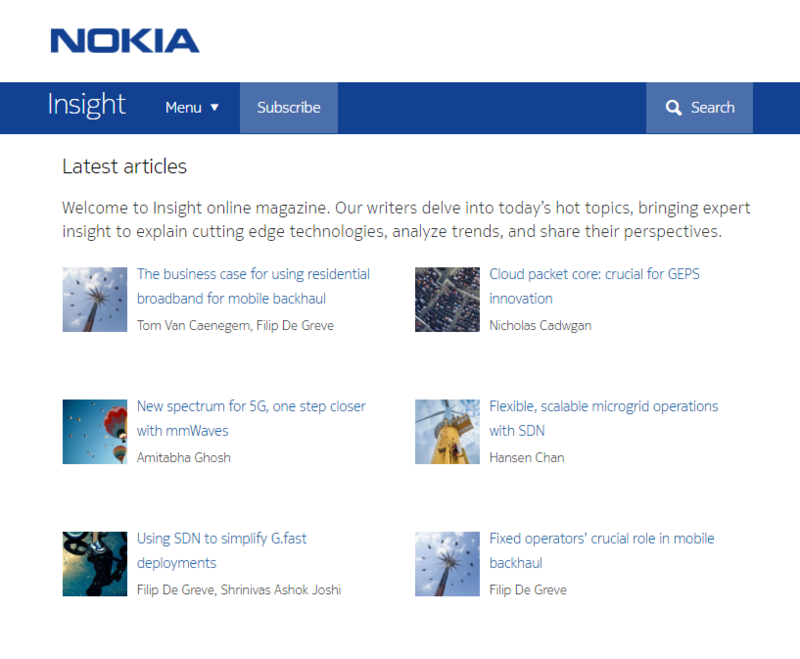 When it comes to tech content, the Nokia Insight blog has it down to a T. Their team has mastered the art of conveying complex subject matter through strong writing. This has helped the Insight blog build a loyal subscriber base who turn to Nokia for technology insights. Pro Tip: Technology-focused content is unique. Bloggers have to understand technology and craft compelling content. If not, readers will see through the content and look for other blogs that can cater to their needs. Social promotion is a powerful tool for reaching online communities. This is because the sheer numbers of social media users are reaching staggering volumes. Promoting content on social media has a win-win dynamic. First of all, your content potentially reaches all of your follower-base. Which, if you’re active in your communities, can reach a lot of users. Second and more importantly, if you create valuable content, your community shares that content with their followers. And this is the beauty of social media. When it comes to social promotion, the You.i Blog knows what they’re doing. Their content team uses the power of social media to bring interested visitors to their blog. The result of their blog promotion efforts are high blog visitor traffic and increased thought-leadership in their industry. Pro Tip: Promoting your blog on social media shouldn’t be a spray-n-pray approach. Rather, you should be tactical. This means targeting the right networks to reach the right readers. Find out which social channels your audience prefers, and center your promotion on that network. For blogs with a large reader base, not all subscribers fall under one persona. With this in mind, you have to create content that appeals to different reading styles. This can be accomplished through author diversity, by using a wide range of writers to generate content for the company blog. 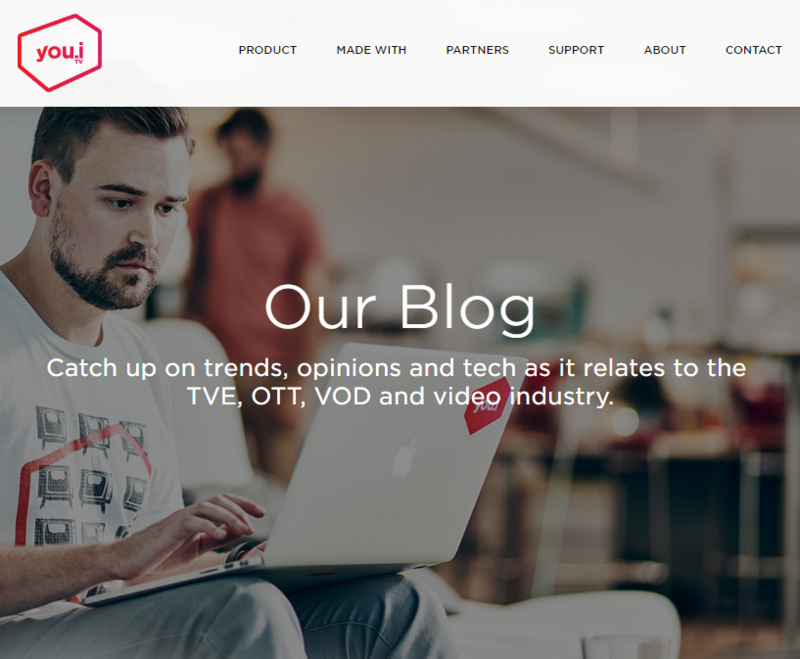 With over 10 content contributors, the Nuage Networks blog is one of the most diverse content teams we’ve come across. Because they have a large team of content contributors, their blog content reaches their entire audience. Pro Tip: expanding your content team helps you reach more diverse audiences. 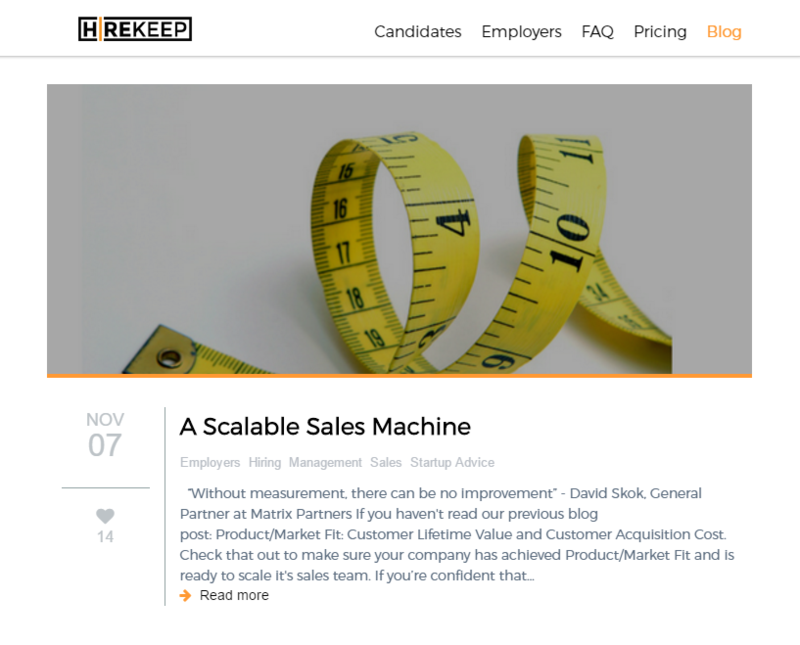 You can look inside your company for colleagues to contribute content. Which is a smart route, because these contributors know your business and products/services best. You can also look outside the company for guest contributors. Going this route is also beneficial, as guest contributors often bring their network to your content. Optimizing blogs for search engines is a must in 2017. When done right, blog SEO brings in organic visitor traffic by the boat-load. But why is an ocean of organic traffic so valuable to your company? It’s due to user intent. A search engine user is looking for answers. And your blog content is there to answer those questions. When this occurs often, you’ll become trusted source in your industry. And trust is what turns prospects into customers. 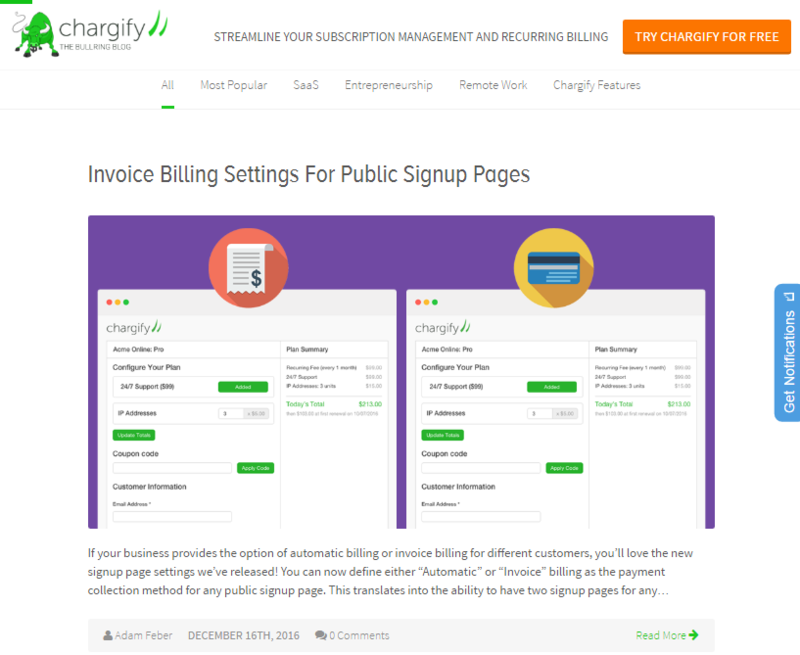 The Chargify Bullring Blog is no stranger to blog SEO. With well-optimized content, the Bullring blog wrangles up qualified visitor traffic through search engines. Pro Tip: Blog content and SEO go together like Christmas and ugly sweaters. Want to optimize blogs for 2017? Give the Pagezii SEO Grader a go and crack the top of SERPs. Crafting blogs for a variety of readers is no easy task. It calls for strong writers that know how to reach niche audiences. For certain industries, a wide-ranging writing style is the only way to communicate with your entire audience. The HireKeep blog writers have this technique down to a tee. They have content targeted for a variety of readers, helping address their whole audience. Pro Tip: The key to successful blogging is content accessibility. This means your blog writing resonates with readers. This is key for retaining a blog subscriber base and turning visitors into prospects. That does it for the new year’s edition of the Pagezii blog roundup. Check back next month too for more inspiring company blogs – who knows, maybe you’ll see your blog featured!